8:00 AM Early Bird Discounted Flights - "Big Sky"
Click the "BOOK NOW" button if you'd like to book an Early Bird $10 Discount flight. We depart at 8AM, 9AM & 10AM. (Start time varies by season). 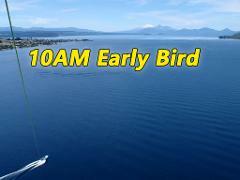 8:30 AM Early Bird Discounted - "Stephanie Lynn"
9:00 AM Early Bird Discounted Flights - "Big Sky"
9:30 AM Early Bird Discounted - "Stephanie Lynn"
10:30 AM Early Bird Discounted - "Stephanie Lynn"
11:00 AM Parasail Flights - "Big Sky"
Click the "BOOK NOW" button if you'd like to book a flight from 11AM till Close. We depart every hour on the hour. 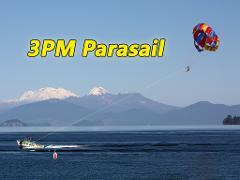 11:30 AM Parasail Flights - "Stephanie Lynn"
12:00 PM Parasail Flights - "Big Sky"
12:30 PM Parasail Flights - "Stephanie Lynn"
1:00 PM Parasail Flights - "Big Sky"
1:30 PM Parasail Flights - "Stephanie Lynn"
2:30 PM Parasail Flights - "Stephanie Lynn"
3:00 PM Parasail Flights - "Big Sky"
3:30 PM Parasail Flights - "Stephanie Lynn"
4:00 PM Parasail Flights - "Big Sky"
4:30 PM Parasail Flights - "Stephanie Lynn"
5:00 PM Parasail Flights - "Big Sky"
5:30 PM Parasail Flights - "Stephanie Lynn"